There are some buildings that we take for granted because they’ve always been there, especially a unique structure like the Seattle Space Needle. It’s so iconic, that tourists seem to think it’s illegal NOT to take a picture of it when they visit Seattle. The 605 foot (184.41m) tall structure (to the tip of the antenna) houses a rotating restaurant on top and one of the best views of the city in its observation deck (520ft, 160m). 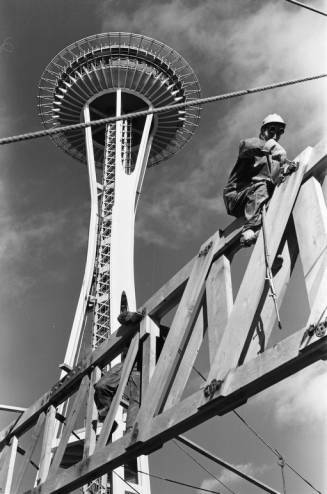 Completed in 1961, just in time for the 1962 World’s Fair, the Space Needle was actually the tallest building in the State of Washington until 1969. The entire construction process took just under 8 months. 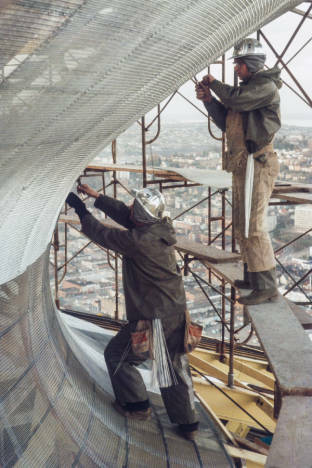 Although it’s one of the most heavily photographed buildings in America today, very few photos of the actual construction process were ever discovered. 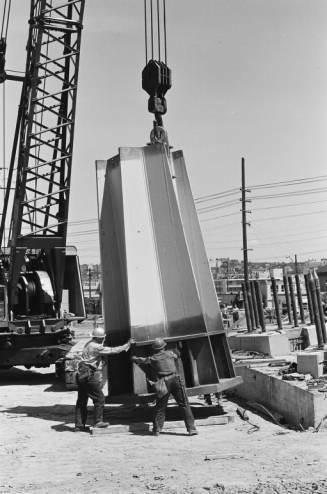 For 50 years, historian George Gulacsik had thousands of pictures of the under construction structure stashed away in a closet and they were just recently found two years ago. Since then, the photos have been donated to the Seattle Public Library by his wife, Sally. The Library then converted the photographs to digital copies and made them all available for download online. 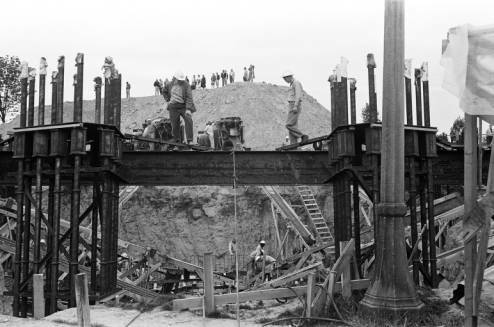 It’s truly incredible to have so many amazing pictures of how structures were built back in the early 60’s. Equally as amazing is how many processes look roughly the same, minus a few technological advances here and there. I can personally guarantee that there were far less smartphones on this job site than a typical one today. 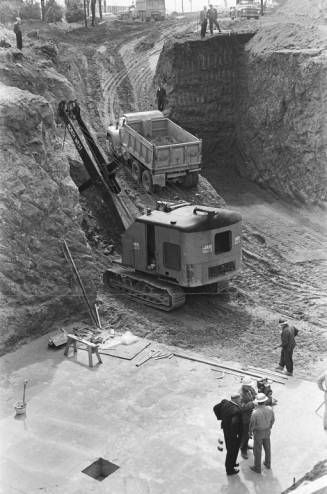 There’s even one picture of an excavator that looks very similar to the one an Indianapolis man has in his historical construction equipment collection. We chose a handful of our personal favorites to share in this article, but you can check out the thousands of others in the gallery by clicking here. 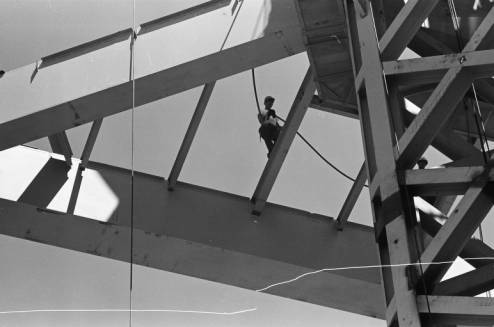 As you’ll see in the photos, other than hard hats, there’s virtually no safety equipment worn by the workers. 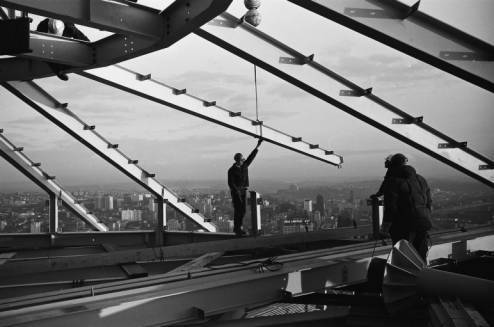 Even so, there were no worker deaths during the entire project. 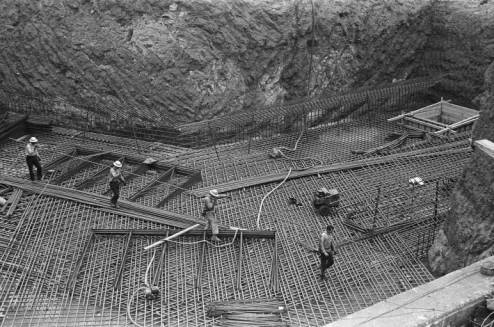 The first three months of the project were spent (unsurprisingly) excavating the site, pouring the foundation, constructing the core, and installing the Needle’s leg bases. 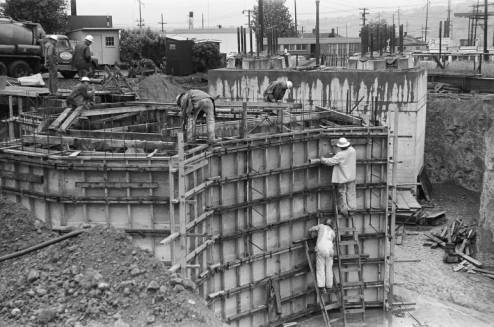 The lot where the space needle was to sit was only 120 feet by 120 feet, so the foundation had to start 30 feet below grade. 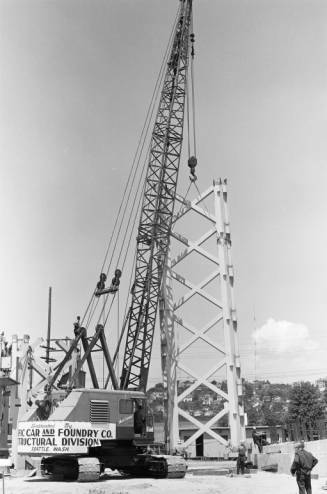 467 concrete trucks were used to pour roughly 2,800 cubic yards of concrete for the foundation, which also included over 250 tons of steel rebar. 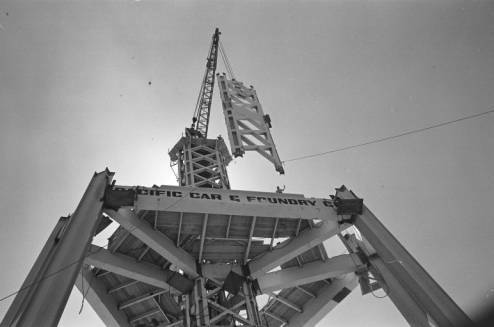 The first leg of the Space Needle was lifted into place on July 19, 1961, by Pacific Car and Foundry Derricks. Inspectors used x-ray equipment to make sure that all of the welds were properly installed at the end of the night. 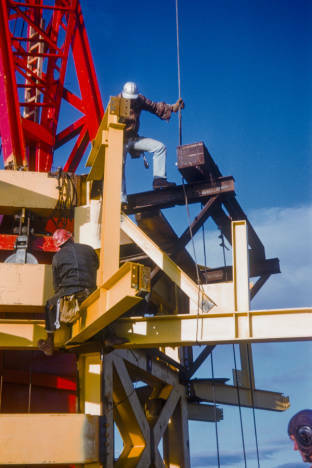 Most of the ironworkers on site made under $4.00 per day, which is roughly $31.74 in 2016 dollars, according to dollartimes.com. That’s an extremely small amount for the dangers of that job. 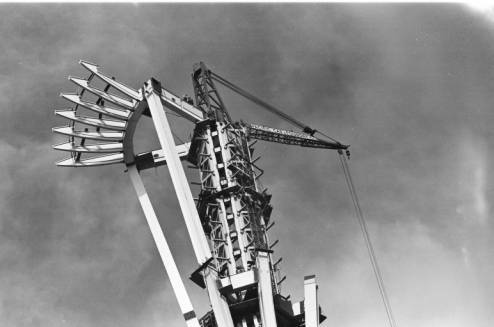 In October, the structure reached a height of 450 feet before the iconic “halo” was installed on top of the legs. 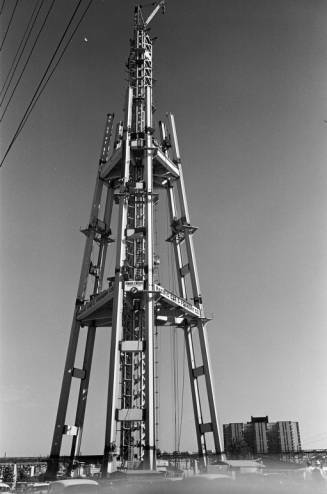 Once the gas torch was installed at the Needle’s highest point on December 8, the workers installed an American flag on top and held a ceremony to commemorate the event. 6 days later, the flag was replaced with a Christmas tree by a man dressed as Santa Claus. 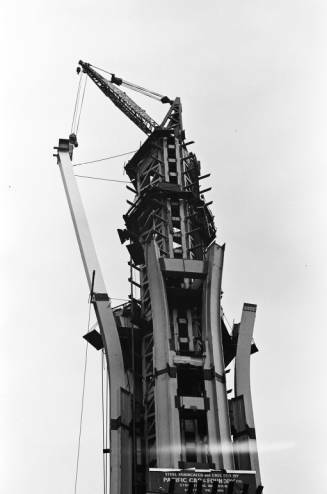 For more information about the construction of the Space Needle, you can even download George Gulascik’s notebook, in which he documented daily milestones of the project. That’s some serious dedication.